Thanks to a comment by Robin (be sure to check out the stories on her blog), I was reminded how handmade doll clothing can be more meaningful than the dolls themselves. Sewing doll clothing for me is how my grandmother Marie stirred my love of dolls. Grandma was the Head Fitter of the 28 Shop at Marshall Field’s flagship store in Chicago for years and an artist with a needle. Grandma handed me another large, but more beautifully wrapped, box. I untied the grosgrain ribbon and discovered she had sewn an array of beautiful dresses trimmed in selfsame bows and flowered beads. 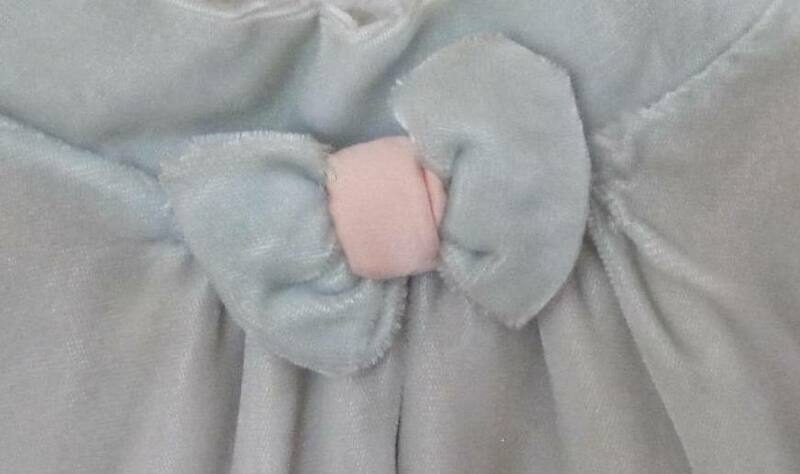 The beret Grandma created for Bonnie matched the pink satin-lined pale blue velvet coat. When I was eight, Grandma sewed me a glorious trousseau of clothes for the imitation Barbie (Miss Suzette) my parents had given me. My doll didn’t have the requisite zebra-striped swimsuit or the Enchanted Evening gown and fur stole, but she had a copper satin cocktail sheath covered with a copper rose point lace outer skirt. Both were trimmed in copper seed beads. 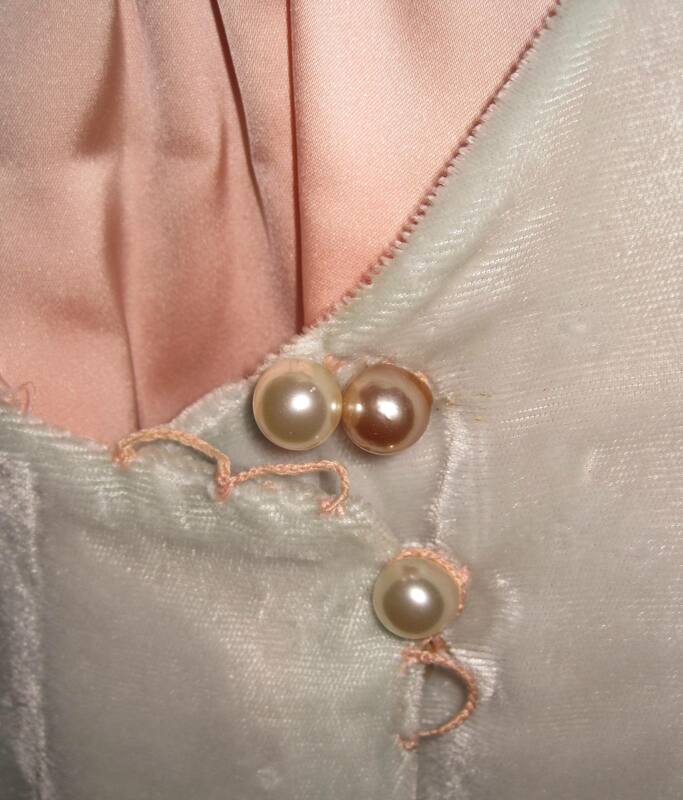 The wedding dress of white satin was heavily beaded with real seed pearls. A lace trimmed slip fit underneath and the veil was matching lace and beaded with the pearls. I looked for stitches to see Grandma’s tricks, but they were invisible as all good magic. When I was away at college, my mother gave the Barbie clothes away. While Bonnie has always sat on a chair in my bedroom, for a long time I kept Bonnie’s clothes in a small suitcase in my closet, away from dust and sunlight, and reveled in the knowledge that I had preserved these treasures. After moving to my last house, I decided to put them away more securely. Then I forgot where I put them! For years I thought they were lost. Finally, last year, I found the clothing. The only piece missing is the velvet beret. All I have left of the Barbie clothes are the memories as I don’t have a photo of them. All these years later, my parents have given me my grandmother’s German porcelain doll and the clothing she made for her. These doll clothes represent all the beautiful clothing my grandmother designed and sewed over the years. Clothing, Art really, which is long gone. What a great feeling it must have been to discover the clothes. Your grandmother was very talented! Thanks, Jill–on her behalf! She was so talented! I regret that the most intricate, detailed, work-intensive pieces (the Barbie clothes) are gone. Thanks for reading! The doll clothing is exquisite and to think that your Grandmother handmade them for you, makes the clothing all the more special. I love stories of love, Luanne! You were wise to pack the clothes up and stash them away to be rediscovered. My Barbies and their clothing were given away as well. I wish that I still had them. Aw, I wish you still had them, too! They are all so special! I wish I had saved some of the clothes she had made for me, too! Luanne, thank you for including my name as an inspiration for your post. Your grandmother was an excellent seamstress and held a very prestigious job in those days! I really love the details you included in this, including your opening the gifts that enclosed handmade clothes and a special life size doll, Bonnie. I also like your wardrobe description of Miss Suzette with her copper sheath and finery. I always loved my Mom’s sewing, she would make the two of us matching outfits. I had a corduroy skirt with a vest that had a nice bandana, quilted print. I think the skirt is with my oldest daughter. She loved to make her grandchildren Barbie dresses. I put my oldest grandson in a jacket made of terry cloth, to wear at the pool, this summer. It had been my youngest brother’s with anchors and ships, red, white and blue. Do you have pix of the two of you wearing the matching outfits? You are so lucky to still have some of the clothing items! Thanks for making me think of this subject, Robin! If you can be Fresh Pressed three times, this should be number three. Haha, thank you so much for that vote of confidence! What a wonderful post, Luanne! I have a friend who has sewn doll clothing for her granddaughter as well as upholstery for her doll house! I can only hope that her granddaughter will come to appreciate these gifts as much as you’ve appreciated yours. Thank you so much for sharing these memories and the photos. How marvelous! I love the idea of the upholstery, making it so special! I hope your friend’s granddaughter will, too, and that her son or daughter will make sure that they aren’t gotten rid of when the child gets older. Actually I’ll send her the link to your post and perhaps that will inspire her to at least take photos of what she makes for her granddaughter. Beautiful gifts from your grandmother! A lovely post. Theresa, thank you so much for your compliments. I am so blessed to have these treasures from my grandmother.